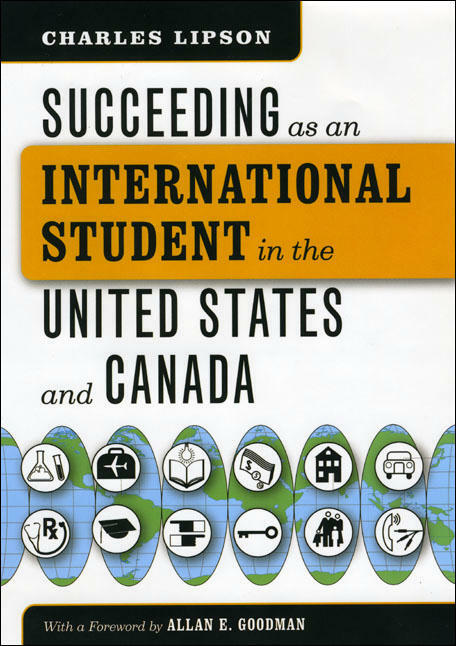 The University of Chicago News Office has posted a podcast featuring Charles Lipson, author of Succeeding as an International Student in the United States and Canada speaking about his new book. In the podcast, Lipson addresses many of the hot button topics for foreign students trying to adapt to life in the United States and Canada, both in and beyond the classroom. From the norms of classroom participation to obtaining health insurance, Lipson covers what students need to know to have a successful and enjoyable adventure as an international student. To find out more listen to the podcast or see this special website for the book featuring reviews, info on institutional use, and an excerpt from the book, “Passports and Visas: A Quick Overview.” . . .
Today’s issue of the the Chicago Reader—the Spring Books Special—has a nice little feature about the writer of The Chicago Manual of Style Q&A. But if you’re hoping that the identity of the Q&A writer will at long last be revealed to all the world … you’ll be disappointed to learn that the woman behind the wit of the Q&A has adopted a pseudonym, Jody Fisher. Every month new entries are published to the The Chicago Manual of Style Q&A. Here’s one from this month’s lot: Q. Is it really necessary to include “as” before “per”? For example, “Client has requested, as per original agreement, two hard copies of all reports.” Since “per” means “according to,” can’t we just delete the unnecessary (and wordy-looking) “as”? Thank you, great gurus, for your wisdom! A. It is not necessary to add “as.” In fact, it used to be considered incorrect, and sticklers still feel superior when they slash through it. . . .
After months of anticipation the moment you’ve all been waiting for has arrived—the winners of the raffle hosted by The Chicago Manual of Style Online were announced today at approximately 3:00 pm Central Time in the boardroom of the University of Chicago Press. Not one but two lucky individuals were chosen at random from a pool of respondents to the recent CMOS Online survey. The winners receive up to one hundred dollars worth of free books from the Press, that’s right, one hundred dollars worth of FREE BOOKS. Choosing the winning tickets was none other than Director of the Books Division of the Press, Mr. Bob Lynch. In his press release, Mr. Lynch stated that he was pleased to present the awards on behalf of the CMOS staff and thanked the lucky winners for their time spent helping to improve the CMOS Online user experience. Congratulations! . . .
Susan Basalla May, co-author of So What Are You Going to Do with That? 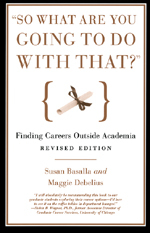 : Finding Careers Outside Academia has posted an interesting FAQ for students preparing for a nonacademic career to the website of the Chronicle of Higher Education. Culled from the question and answer sessions that follow her frequent lectures, Basalla comments on a variety of topics including how to get started as a freelancer and how to explain to potential employers about unfinished dissertations. You can find the full article in the career section of the Chronicle. A witty, accessible guide full of concrete advice for anyone contemplating the jump from scholarship to the outside world, So What Are You Going to Do with That? covers topics ranging from career counseling to interview etiquette to translating skills learned in the academy into terms an employer can understand and appreciate. Packed with examples and stories from real people who have successfully made this daunting—but potentially rewarding— transition, and written with a deep understanding of both the joys and difficulties of the academic life, this fully revised and up-to-date edition will be indispensable for any graduate student or professor who has ever glanced at her CV, flipped through the want . 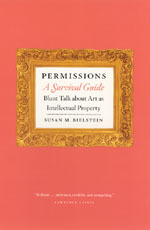 . .
Susan Bielstein, author of Permissions, A Survival Guide: Blunt Talk about Art as Intellectual Property will appear on Library Café, a program on WVKR Independent Radio FM 91.3 in Poughkeepsie, NY, on March 27th at 11 am CST. Bielstein will join host Thomas Hill to discuss her book. You can tune in to a live broadcast online at the Library Café where they should also post archived audio after the show. Organized as a series of “takes” that range from short sidebars to extended discussions, Permissions, A Survival Guide explores intellectual property law as it pertains to visual imagery. How can you determine whether an artwork is copyrighted? How do you procure a high-quality reproduction of an image? What does “fair use” really mean? Is it ever legitimate to use the work of an artist without permission? Bielstein discusses the many uncertainties that plague writers who work with images in this highly visual age, and she does so based on her years navigating precisely these issues. As an editor who has hired a photographer to shoot an incredibly obscure work in the Italian mountains (a plan that backfired hilariously), who has tried to reason with artists’ estates in languages she . . .
Seventy years ago, in a small office at the University of Chicago, dissertation secretary Kate L. Turabian changed forever the way research is reported. Asked to provide students with a style guide, she wrote a small pamphlet describing the correct format for writing college dissertations. That pamphlet eventually became A Manual for Writers and has gone on to sell more than eight million copies in six editions. This spring the University of Chicago Press will publish the seventh edition of her widely used and respected Manual—now fully revised to meet the needs of a new generation of students and researchers. The stellar team of Joseph Williams, Gregory Colomb, and Wayne C. Booth, master teachers and authors of the bestselling Craft of Research, have thoroughly updated the Manual while respecting the Turabian tradition. 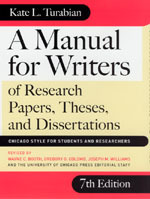 With this careful revision, they have ensured that A Manual for Writers will remain the most valuable handbook for writers at every level—from first-year undergraduates, to dissertation writers, to senior scholars. Read the press release. Much more information will soon be available at www.turabian.org. . . . Pulling your hair out searching for that last minute gift? You can’t go wrong with The Chicago Manual of Style. It might not fall under the category of “fun” gifts, but it won’t require two ‘C’ batteries, or any assembly. It’s perfect for the person who has everything and universal enough to be appreciated by everyone from students to professionals—you’ve got all the bases covered with a shiny new copy of The Chicago Manual of Style. Heck, run down to the local bookstore and pick up two just in case there’s anyone you forgot. And remember, The Manual is now available as a CD-ROM and an online version as well—with our online subscription service you won’t even have to fight the crowds at the mall to get it. Want more gift suggestions? Tempt your mind in our gift catalog. Happy Holidays! . . . The Google Print Library Project is the latest of Google’s efforts to digitally copy and distribute the holdings of several of the world’s largest libraries—a project which has incited controversy among both the book industry and academe alike. Google presented this digital repository as a first step towards a long-dreamed-of universal library, but skeptics were quick to raise a number of concerns about the potential for copyright infringement and unanticipated effects on the business of research and publishing. Google is being sued by Association of American Publishers for copyright infringement. 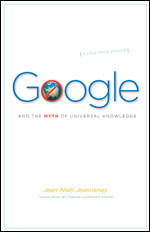 Jean Jeanneney’s new book Google and the Myth of Universal Knowledge exposes the controversy surrounding this important issue and articulates some of the most powerful arguments why Google’s Library Project might spell bad news for those concerned about the world’s literary and cultural heritage. A review in the October edition of the ALA Booklist gives an intelligent summary of Jeanneney’s argument: From Europe’s point of view, Google’s proposal to digitize the content’s of America’s leading libraries raises questions beyond the copyright issues that presently beleaguer the project. This brief salvo from the president of France’s Bibliothèque Nationale challenges directly Google’s assertion that its venture offers a source of universal knowledge. . . .